Image and article from the Irish Independent newspaper printed 22nd December 2001. Light at the end of the tunnel: the sun makes its way into the main chamber at Newgrange during the winter solstice yesterday. There was brief light at the end of the tunnel yesterday as visitors to Newgrange got a tantalising glimpse of the splendour of the winter solstice. 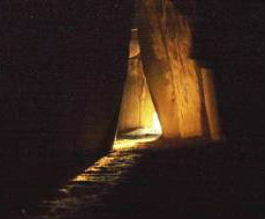 A narrow beam of light briefly illuminated the 5000-year-old burial site, but cloud on the horizon meant the sun failed to thoroughly penetrate the passage grave for the annual 17-minute window into the ancient world. Around 24 people crowded into the chamber at dawn yesterday, headed by Arts, Heritage, Gaeltacht and the Islands Minister, Sile de Valera, and her Northern Ireland counterpart, Michael McGimpsey. The small group shuffled in the near-total darkness of the inner sanctum, the cold seeping from the ancient stone slabs of the monument which predates the pyramids of Egypt by 500 years. "Now we know what Bin Laden feels like," one wit ventured as we peered through the cave-like darkness waiting to see what fate had in store. At 8.58am the sun peeped out over the rolling fields of Co Meath but low-lying cloud meant its rays could not reach into the 25-cm roof box over the door to the tomb. However by 9.06am stones on the 19m-long passage began to gleam in the winter sun, and shortly afterwards a razor-sharp narrow beam of light lit up as far as the middle of the cross-shaped chamber. Faces that had moments before been almost totally obscured by the dark became dimly visible in the solstice light for a few awe-inspiring minutes. The chosen few inside included the first members of the public to be randomly selected to attend after administrators Duchas abandoned the years-long waiting list in favour of a lucky pick for anyone who applied. 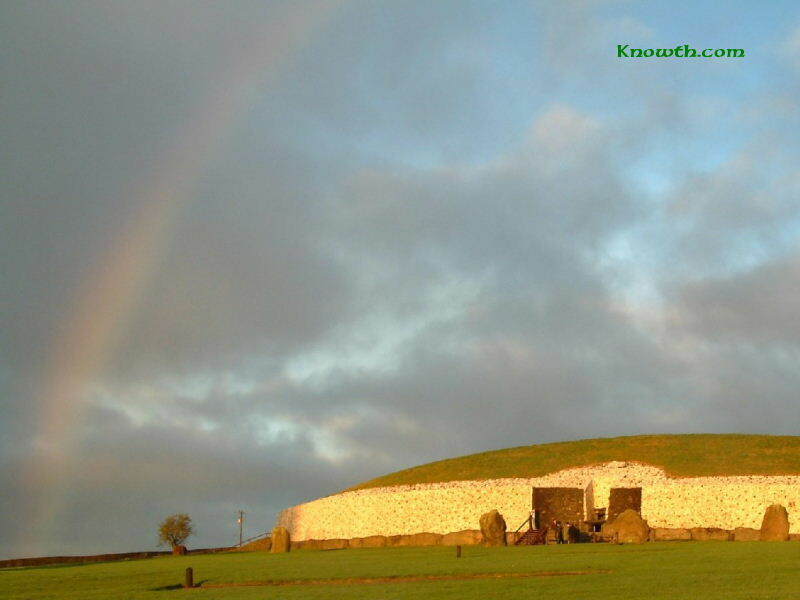 Outside the passage tomb a crowd of over 80 people including Americans and Spanish watched a beautiful sunrise glow off the entrance, which the ancients faced with Wicklow quartzite for maximum shine factor. Archaeologists are currently attempting to locate the origins of the large structural stones, with early speculation that they may have come from Clogher Head, begging the question of how our distant ancestors transported them upriver, said UCD archaeologist George Eogan. Aideen Sheehan - Irish Independent. Solstice literally means 'Sun Stands Still', for a few days around the time of the winter solstice the sun appears to stand still in the sky in that its elevation at noon does not seem to change. Click here for more information.